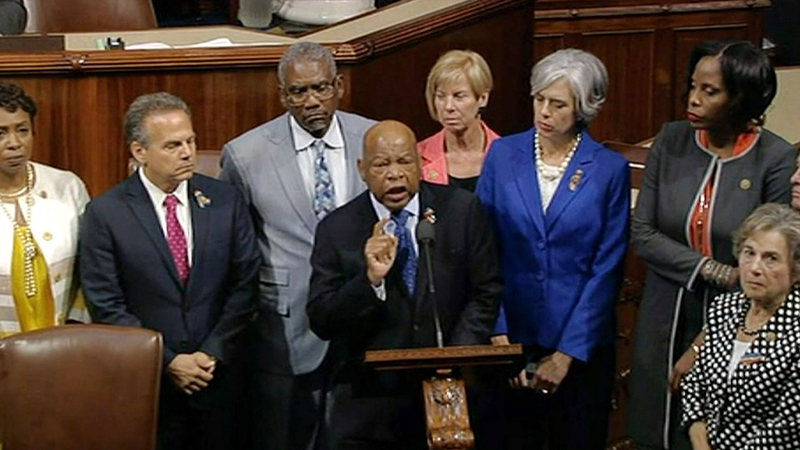 In this frame grab taken from AP video Georgia Rep. John Lewis leads more than 200 Democrats in demanding a vote on measures to expand background checks and block gun purchases. House Democrats have ended their 25-hour sit-in on the chamber's floor that they've been staging to demand votes on gun control. With just a few interruptions, Democrats commanded the House floor since 11:30 a.m. Wednesday. The protest was broadcast live to the world over social media. There are no indications that Republicans - who control the House - have met the Democrats' demands. Democrats wanted votes on bills strengthening background checks and barring firearms sales to people on the government's no-fly list. Still, Democrats are declaring victory anyway. One of the protest leaders, civil rights veteran and Georgia lawmaker John Lewis of Georgia, says: "We are going to win this struggle."